Hiddleston, Goodman, Larson and Jackson might have reached the titular island via a fleet of heat-packing Hueys, but I’m taking the more sedate route offered by Clubcard points. And so on 27 March 2018 – a Tuesday lunchtime – I find myself in a queue outside the world-famous wax emporium in Baker Street, London. There don’t appear to be any signs telling visitors which of the many doors they need, but I’ve come prepared. Door 2, says the website, is for people who are “exchanging vouchers from BIG BUS, Ticmate, Evans and Evans, Golden Tours, Tesco or Visit Britain”. So door 2 it is. However, after 20 minutes’ wait and 20ft of shuffling, I’m told by a patrolling staff member that I actually need door 4, which the website says is for people who purchased tickets online and have a time slot. It’s a disappointing start but I keep my eye on the prize, and it isn’t too long before I’m inside the building, mingling with stars of stage, screen and the tabloid press – well, their wax likenesses. Madame Tussauds is very accommodating when it comes to photography. Cameras are welcome and there are no ropes or barriers. You can go right up to most of the figures and even put your arm around them. So as long as you’re not shy about posing in front of strangers and are prepared to dive in (there are no queues; just chances you have to grab), you can come home with some fun pics. The route around the building is self-guided – follow the signs, basically – and the Kong: Skull Island exhibit is quite near the start. If you don’t fancy encountering its oversized star, a sign notes that the area can be bypassed, though if you’re unsure, it’s easy enough to poke your head in and check it out first. 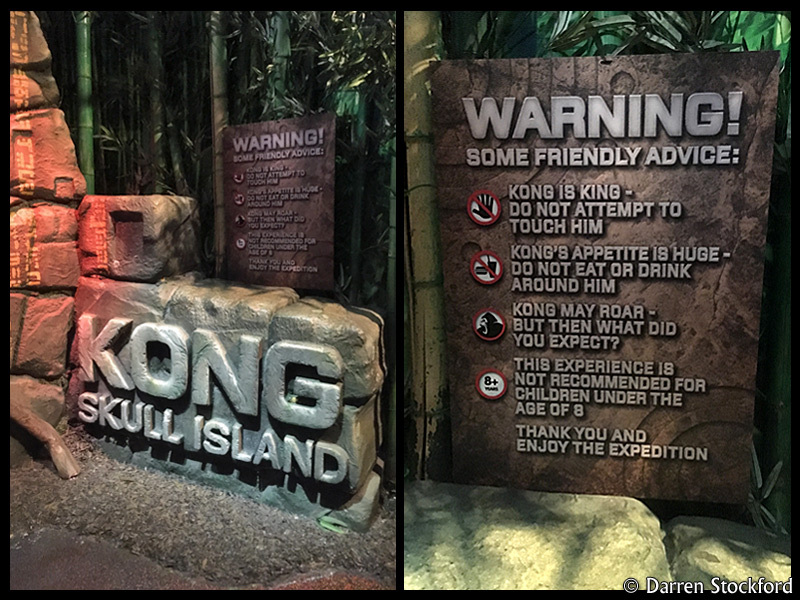 Walk past the entrance and you’ll find another door – the exit – and Kong is visible from there. Of course there are rules: don’t touch Kong, and don’t eat or drink around him. And there’s some guidance, too: be sure that your kids can handle the experience, and get ready to hear the ape roar. With talk of a journey, you might be expecting a large jungle set. But in terms of floor space, the attraction is actually quite small. With talk of a journey, you might be expecting a large jungle set. In reality, there’s an entrance area housing the human figure, a short corridor in which a giant spider lurks, and the main, stage-like section that houses the Kong head. In terms of floor space, the attraction is actually quite small, and the only challenge is judging the best time to take your photos. The Conrad/Hiddleston figure is a very good likeness, though it’s currently missing a chunk of its left earlobe (see photo below). It stands in front of a green screen, and every so often a staff member asks people if they’d like to pose for a photo with the figure. If you feel that your acting chops are up to looking brave then terrified, it’s worth a shot, as purchase of the pictures is optional. The photographer gives you a barcoded card, and if you hand this in at any ‘photo point’ you can see the finished images, which come with a composited Kong – the film version. One pic features his head, the other his hand. Alas, I’m not impressed with mine. The lighting doesn’t seem to match the composites, and I don’t like the price much either – £14 for one; £17 for two – so I don’t buy. To the left of Conrad (the figure’s left) is the spider’s lair, where you can walk beneath a long-legged beastie bathed in red light. The model isn’t as big as the spider in the movie – a creature that’s responsible for one of the film’s most memorable deaths – but it’s still kind of creepy. So far, every visitor has made it out of the spider’s lair alive, but if you don’t fancy risking it, or if your arachnophobia is bringing on the old ‘fight or flight’, don’t worry as it’s possible to bypass this section and go straight to the main attraction. 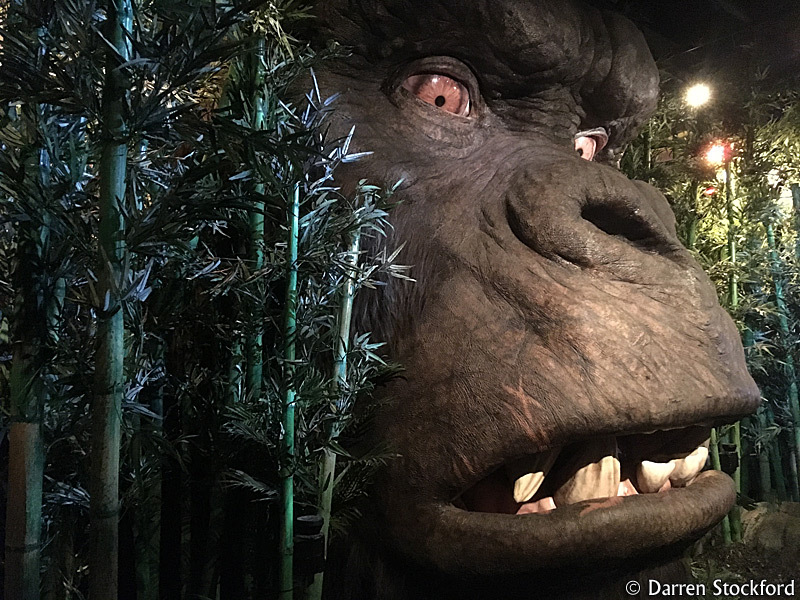 Kong himself is an impressive 18ft-tall head that pokes through some trees. Naturally, he’s the centre of attention, though most people seem to respect the space immediately in front of him. By an unspoken consensus, it seems, that’s reserved for anyone wanting to pose with the ape for a photo – as almost everyone does. Kong himself is an impressive 18ft-tall head that pokes through some trees. Naturally, he’s the centre of attention. 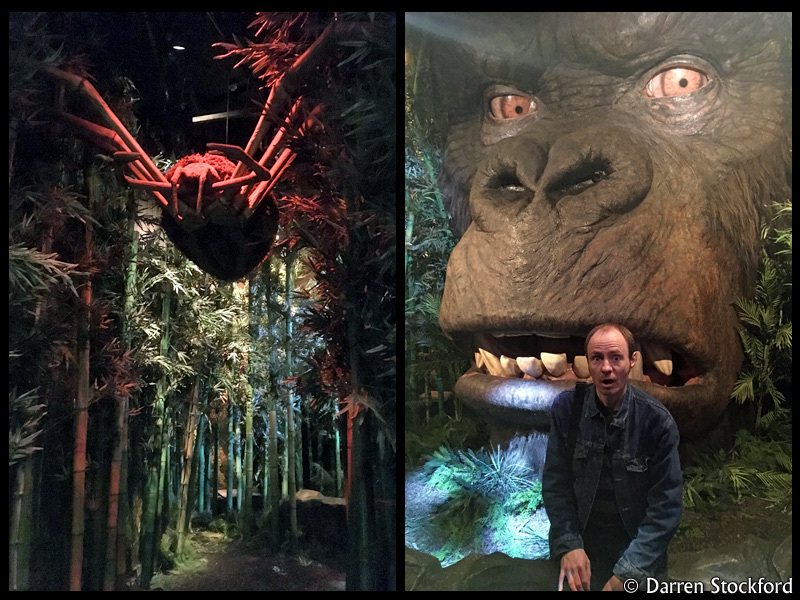 With his twitchy nose and moving eyes, which apparently follow visitors around, Kong’s animatronics are evident. But having seen videos of his mouth moving, I’m surprised that it isn’t today. And the sounds he’s making don’t, I feel, live up to the promotional claims. “Feel the roar!” says the website, promising something akin to “the sound of a Boeing 737 about to land”. However, the reality, during my visit at least, is a low rumble. Have they turned Kong’s volume down since the exhibit was opened? Perhaps the big lug only lets rip at certain times. On the plus side, his likeness to the film’s computer-generated star is strong and his presence is imposing. As a Kong nut, I’d be happy to go and see him even if he was a static model. Today I hang out with my hairy hero for half an hour, and I consider it time well spent. Visitor tips? I have just one, and that’s to make sure Kong’s eyes are open when you take photos. If you’re watching your friends or family, it’s easy to miss the giant ape behind them blinking. And that’s not something you want to notice back at home, when it’s too late to do anything about it. 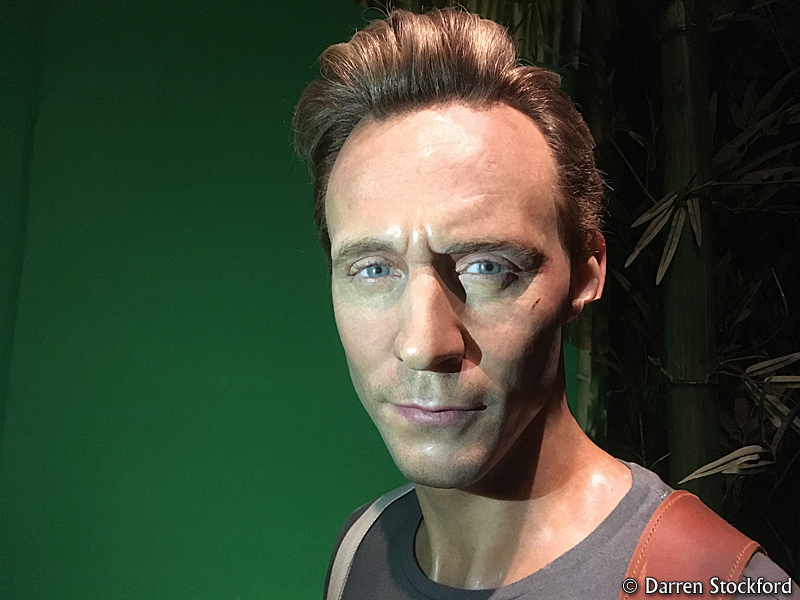 I enjoy the rest of my day at Madame Tussauds, spending a total of three hours wandering around its various areas. Some of the figures’ likenesses are better than others, but most are very good and some, such as Steven Spielberg and Eddie Redmayne, are outstanding. Of course, at the end of an afternoon such as this, one must have a nose around the gift shop – it’s the first law of tourism. So I do, and I’m pleasantly surprised to see some Kong: Skull Island merch. There are no exclusives, which is a bit of a shame – I was hoping for some Kong at Madame Tussauds postcards, at least – but it’s nice to see a shelf full of large Pop Vinyl figures, at £20 each, and a couple of racks of licensed T-shirts, also costing £20. Though you can buy these goodies cheaper elsewhere, these prices aren’t unreasonable, so fair play. Thankfully, this morning’s mishap with the entry queue wasn’t a portent of doom, and I’ve survived my trip to Skull Island. Now, I guess, it’s time for me to catch a ramshackle boat out of here and await Kong’s cinematic return in May 2020, when he’ll be battling another big-screen behemoth, Godzilla, and I’ll hopefully be reprising my slack-jawed look from the photo above.